Exclusive: The Trayvon Martin case, in which a community watch volunteer killed an unarmed black teen-ager in a hoodie, roiled the U.S. last year. Now, a California deputy has gunned down a Latino boy carrying a toy AK-47, raising other troubling questions, as Dennis J Bernstein reports. On Oct. 22, at 3:14 in the afternoon, 13-year-old Andy Lopez was walking to a friend’s house on the outskirts of Santa Rosa, California, to return the friend’s toy rifle, when two Sonoma County sheriff deputies drove up behind him in a marked police car and say they mistook the replica AK-47 for a real gun. Sheriff’s Deputy Erick Gelhaus, a training officer with 24 years experience in the department, later told investigators that he shouted at the boy to drop his “gun” and that when Lopez turned, Gelhaus feared for his life and opened fire, riddling the eighth-grader with seven bullets from a 9 mm Smith & Wesson handgun. According to the other deputy, who was driving the car and who did not open fire, the shooting was over in just a few seconds, even before he had time to move from behind the wheel and take cover behind his door. The slaying also has raised questions about blowback from the U.S. wars in Iraq and Afghanistan where American soldiers often find themselves in dangerous surroundings and develop a tendency to open fire at the first hint of a threat. Now, some of those veterans are returning to jobs in domestic law enforcement sometimes without adequate counseling or screening before they begin patrolling city streets. The Latino, Chicano and indigenous communities in and around Santa Rosa are still reeling from the slaying, but have moved from mourning at a mass funeral to various actions, demanding justice for the killing. Many see the case as another example of profiling a brown-skinned youth in a hoodie as somehow dangerous and deserving of a shoot-first-and-ask-questions-later response. Almost every day since the killing, there has been some kind of protest, vigil or community meeting. Gelhaus, 48, is assigned to the patrol division as well as being a senior firearms instructor. Before that, he was part of a gang enforcement team. He and the unnamed deputy who was driving the patrol car are now on administrative leave. But Eric Gelhaus is a lot more than your typical deputy on the beat. He is a seasoned weapons expert, firearms instructor, veteran trainer in the Sheriff’s Department, and a range master with extensive training in firearms. He also served in Iraq as a combat leader and a weapons trainer. Gelhaus is also an adjunct instructor for various gun-training centers, among them, the Arizona-based Gunsite Academy that provides extensive weapons training for law-enforcement as well as “free citizens of the US” and has close ties to the National Rifle Association and various gun manufacturers. Gelhaus’s LinkedIn page notes that he worked for Aimpoint, a company that develops new technology for a whole assortment of firearms. Acting as a moderator for “The Firing Line,” an online forum for gun enthusiasts, sponsored by S.W.A.T Magazine, Gelhaus, in his own name, reflected on all aspects having to do with the owning and use of guns including the use of force if someone fires a BB gun at another person. Whether Gelhaus will ever have to answer any hard questions as to whether he was trigger-happy when he cut down an eighth-grader with a toy gun in the middle of the afternoon is already in doubt. Given his extensive relationship with the military and his position as a senior police trainer, Gelhaus may be very well insulated. In the initial stages of the investigation, it was announced that the Federal Bureau of Investigation (FBI) would be conducting a thorough and independent probe to see if there was cause for federal civil rights charges to be filed. On Oct. 25, three days after the slaying, FBI spokesman Peter Lee told local reporters that the Bureau had begun a “shooting review,” calling the incident “a civil-rights type of case.” But last week, Lee was non-committal and said nothing about any kind of independent investigation that the FBI would do. Senior officials in the Sonoma County Sheriff’s Department have described Gelhaus as a “solid employee” with “a lot of credibility in the department,” according to local news reports. Gelhaus has testified as an expert on narcotics trafficking and gang-related activities. According to law enforcement records, Gelhaus has never killed anyone before in his capacity as a Sheriff’s deputy. But there were some warning signs in his record. According to local press reports, Gelhaus got into a scuffle with a couple of minors in 1997 and apparently battered them with a flashlight. But a jury later found that Gelhaus and the Sheriff’s Office were not liable in a civil lawsuit alleging excessive force against the two minors, Karla and Israel Salazar. Legal experts say it is rare for a police officer to be charged criminally in a shooting when a claim can be made about a life-threatening situation, even when the threat turns out to be non-existent. A greater legal opening can be available to victims and their families in civil actions claiming wrongful injury or death. 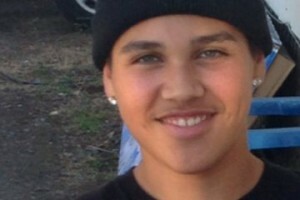 On Monday, the attorney for the Lopez family, Arnoldo Casillas, announced that the Lopez family had filed three separate wrongful death claims, seeking damages against Gelhaus and the Sonoma County Sheriff’s Department. The lawsuit states that Lopez was unarmed and posed no risk or threat to the deputies or others and was shot without cause or provocation, a overzealous use of force condoned by the Sheriff’s Office. “The Sheriff’s Department’s training encourages deputies to prematurely shoot suspects who pose no threat or danger to deputies or the public at large,” the lawsuit states. It also alleges that the Sheriff’s Office failed to create and implement policies and training to set out clear guidelines for the use of deadly force and proper tactics for pedestrian stops. Lopez’s parents of the slain child were at the press conference and were asked what they wanted in terms of justice for their slain son. The mother, who is undocumented along with her husband, noted that their son was a full citizen of the United States. At an Oct. 29 protest against the killing in Santa Rosa, I spoke to civil rights and human rights attorney John Burris, who has specialized in police shootings particularly in communities of color. Burris said he believes the slaying of Lopez was an “unlawful police shooting” and that Gelhaus should be prosecuted under some type of murder charge. Burris continued, “Certainly, from my perspective, this was an unlawful shooting. This young man was walking. There were no reports of a man with a gun. There were no reports of any illegal activity. The officers pull up behind him, not on the side or in front. They immediately jump out and tell him to drop the gun. “The problem with that, of course, is the young man didn’t have a gun, so he wouldn’t have known if the police were talking to him or not. When he finally turns around, he was immediately shot, with no opportunity to make any statements, to tell them it wasn’t a gun. He was immediately fired upon, which was an overreaction on the part of the police. “It was excessive from my point of view, just thinking about [Gelhaus] firing his gun in rapid succession, particularly because it was without knowing, a supposition, basically an overreaction, making an assumption based on facts that he did not have. “A military person, trained marksmen, knows how to shoot his weapon, but he also knows about cover, and this is the part that is most disturbing to me. He was in a position of cover, which would have given him ample opportunity to react and talk to this young man before he fired his gun. He said that the gun looked like an AK-47, but there was some different color on it. “The officer never, ever had an opportunity to view this particular weapon because he approached the person from behind. He saw what might have been a weapon, but he did not see it, and more importantly, the kid did not react to him as if he had a weapon. So there are many conditions that would suggest this officer overreacted. Molina told me later that this is a “new day” in a California, where brown folks are “rising up for their rights with a new militancy as the new majority. We are the new majority, and we are feeling our power, especially with the passage of recent legislation such as the Trust Act, and the Domestic Workers Bill of Rights. As Molina spoke, there were police helicopters in the air and fully armed and heavily equipped sharpshooters peering down from the roof of the Sheriff’s Department. There was also an armored personnel carrier nearby. Michael Rothenberg, a local poet and activist, is working with a small group of community people who are helping the Lopez family navigate the various aspects of the massive outpouring from the community, as well as helping them communicate with the lawyers, the public and law enforcement in the aftermath of the killing. This person should never train anyone to do anything. “To Serve And Protect” means different things to different people. Eric Gelhaus likely thinks he did the right thing. But my experience with law enforcement shows me cops have no clear idea about right or wrong, they only know that they must be perceived as being right. That’s pathetic in so many ways. I do not know any of the details, but I do have a question. The boy had a toy gun; he knew it had no firepower. If he felt threatened, why would he point a toy gun at an officer holding a gun? Bobzz, that is why people are so angry. Because according to the sheriff deputy’s account the child pointed his gun at him but if this was true, why was the child shot from behind. So people don’t believe that the child was ever given a chance to turn around or know that the officer was even speaking to him. Gelhause didn’t need to shoot him 7 times. Why not shoot a warning shot or in the leg. Why shoot him 7 times in the back? Seems excessive to me. @ AMM – Yes, I agree entirely with your response. There was apparently NO ongoing crime (much-less violent crime) in progress, so the cautious, even a ‘force-protection’ approach would be to do something like quickly get out of the car, take cover on the other side of engine IF there was a perceived threat, and THEN yell at the individual to “drop his gun”. There’s no reason to elevate the violence of the situation to a ‘do-or-die’ level when there was apparently no ongoing danger to bystanders or anyone else, just a POSSIBLE suspicious behavior situation. On a larger level, this once again sadly emphasizes this country’s attitude problem with firearms, militant police, and militarism in general. What’s a gun-nut like Gelhaus doing in a position that requires way MORE restraint and way LESS brutality than a war-zone? I admit to sympathy for police – – – they do have a tough job because they are REPEATEDLY coming in contact with negative situations & individuals (which is what they’re paid to do, admittedly) – – – but this should require creative, tactful individuals who are NOT hot-headed, ‘macho’, Type-A personalities. And even conversely, why a 13 yr old kid be able to get a semi-realistic looking play-gun when it could easily be perceived as the real-thing and predictably lead to tragic episodes like this? (No, I’m NOT ‘blaming the victim’, but blaming our culture for sensationalizing and enabling these pro-militaristic activities — does we really need life-like toy weapons, when they could easily and predictably be mistaken for real ones? ).